Great Reed Warbler – a 1st for derbyshire! This fantastic bird, found on 12th May 2010 at Straw’s Bridge Pond, near Ilkeston, is a first for Derbyshire. It is also the first in Britain for 2010. Singing from a small patch of reedbed, it can be heard from over 100 yards away. 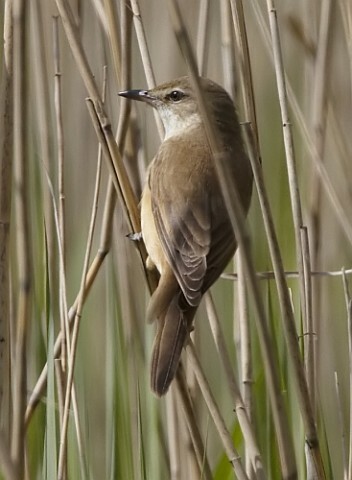 A call similar to a Reed Warbler, but much much louder, almost like a frog at times. Approximately 50% bigger than a Reed Warbler, this bird must have overshot its migration, as it exists on the Continent, but not on this side of the Channel. It has attracted a great deal of interest from birdwatchers and photographers alike, with some travelling from the ends of the country to see this often elusive bird. It periodically flies out of the reed bed into the surrounding trees, disappearing and not calling. 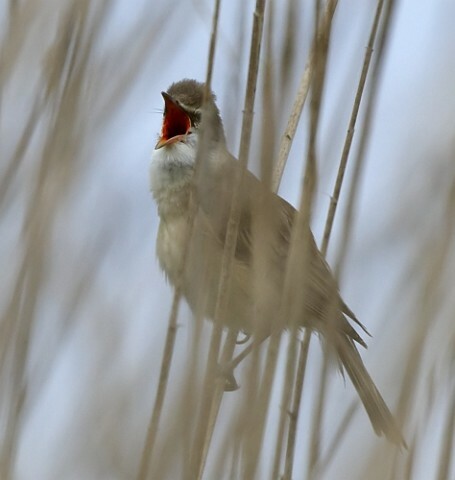 Ten minutes later it appears singing again in the middle of the reed bed – and no-one saw it return there! Apart from its size, it also has a very thick stout bill. 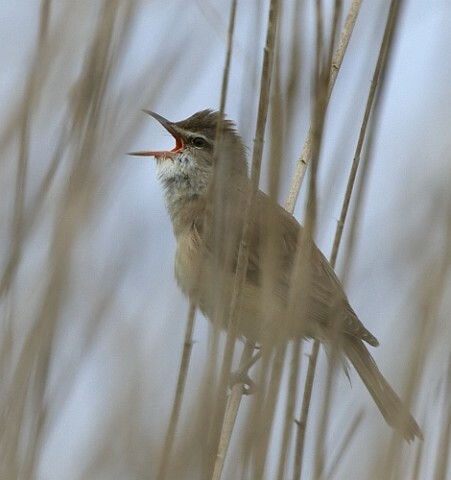 In southern Spain it can be found singing high from the tops of the Giant Reed Beds. Here at Ilkeston, it struggled to do this due to the smallness and weak stems of this immature reed bed. Occasionally it would try, only to bend the reed head and stalk over double, often snapping it. For this reason, it mainly occupied the lower thicker portions f the reeds, which made it difficult to see and photograph. As of the 26th May, it is still there, but who knows how long it may stay. This entry was posted in 2010, Derbyshire, Year and tagged bridge, Derbyshire, great reed warbler, ilkeston, pond, reed, straw, warbler.